Are you looking to buy a fast external storage device for your backup needs? Have a look at this external SSD from Western Digital that may not just fit your expectations, but exceed it! I've been using an SSD on my main desktop computer as well as on my MacBook for some time now. I've been so used to the swift speeds SSDs offer that I think I may not be able to go back to traditional disk-based external hard drives. I do a bit of video editing for YouTube and call myself an amateur DSLR photographer. My current needs made me look for an external storage device that's not only reliable but fast enough to transfer RAW images as well as 4K videos from one device to another. While looking for relevant external drive options in the market, Western Digital offered us the 'My Passport SSD' for review purposes. I grabbed this offer with both hands and reviewed it for others who may be in a similar situation. Western Digital is a very well known and respected name in the IT industry and is one of the most reliable producers of external/internal storage components. I've in the past also used and reviewed their WD Black M.2 PCIe 512GB Solid State Drive as well as the WD Blue 500GB Solid State Drive SSD on Techulator.com. The WD My Passport SSD is extremely lightweight and fits the palm of your hand. It weighs around 40 grams and fits easily into your pocket. It uses a USB Type-C port and comes with a small Type-C to Type-C cable. For users without a Type-C interface, Western Digital also includes a Type-C to Type-A USB adapter. This is a standard plug and play device. All you need to do is to plug it to a relevant USB port on your computer and let it install itself. Western Digital also includes software packages for both Windows as well as Mac OS on the drive itself. Although, the drive works perfectly without the software, however, once the software is installed, it allows you to run diagnostics on the drive as well as offers a lot of other features. The WD My Passport SSD is a solid build with half metal and half plastic design. It feels sturdy and is built to withstand a drop of up to 6.5 feet. I didn't try to drop it intentionally to test it out but did drop it accidentally once. Not surprisingly, it worked perfectly after that. Since I use a MacBook Pro that has Type-C ports by default, I could make full use of the USB 3.1 Gen 2 speeds that this drive can offer. The USB Type-A interface is comparatively slower than the Type-C speeds. 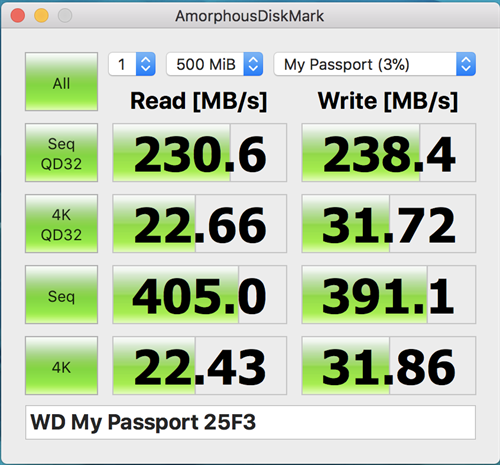 The sequential read/write speeds are pretty close to the advertised transfer speeds and are much faster than what the traditional hard disk drives offer me. I'm very happy looking at the above results as they are pretty close to the results I got with the "internal" WD SATA SSD I reviewed a few days ago. For someone like me, who needs to transfer huge video files from one workstation to another for editing and then re-send it back to the other computer, this external SSD is such a time saver. Keeping it connected for long periods of time, does make it slightly warm but not warm enough to call it hot or be worried about. If you need an additional layer of security for your important files saved on the SSD, you can make use of the bundled software from WD (WD Security) that provides 256-bit AES Hardware Encryption. This will bring in an additional password protection layer before anyone can access the files/folders saved on the drive. The Western Digital My Passport SSD works perfectly well with any system running Windows 7, 8, 10 as well as the Mac. It is a straightforward plug and play connection and does not need any special installation of software or drivers. It is, however, recommended to install the packaged WD software for better diagnostic controls of the drive as well as to utilize the option of Automatic backups to the drive or the cloud. The Type-C USB cable along with the Type-A adapter make this SSD backward compatible with USB 3.0 and USB 2.0 standards. Unlike many other external hard drives, this external SSD does not need external power and works directly off the USB connection from the computer. There's no power port on this device and it, therefore, does not come with a power adapter etc. Western Digital provides a limited 3-year warranty on the device, technical details for which are available in detail in the warranty guide provided in the box. WD My Passport external SSD 256GB.